I’m fortunate to have been able to build my career as one of Library and Information Science (LIS) professionals and familiar with the term Bibliotherapy. The term "Bibliotherapy" was first coined by Samuel Crothers in 1916 and this term is derived from a combination of two Greek words, “biblion” means book and “therapeia” means healing. Bibliotherapy, as defined by Marriam Webster, is, “the use of reading materials for help in solving personal problems or for psychiatric therapy”. The recent column written by Charlotte Cowles explained that “bibliotherapy has been incorporated into medical treatment programmes for depression and other psychological disorders, with positive results”. I recall the day when I first read about Bibliotherapy written by Chittaranjan Bondhopadhaya. He explained how bibliotherapy can boost self-esteem and relationship skills as well as help combat depression, anxiety, stress and other psychological disorders. He stated that the cheerfulness of mind assists in relieving any disease in our body as there exists a strong relationship between mind and body. If our minds are not feeling well then it affects our body as well. For this reason, doctors suggest every patient needs to keep their mind happy. If someone gets afraid and feel sick then he needs to read such types of books which help him/her to get back courage. Have you heard about the Italian poet Petrarch who used to read book regularly and the interesting thing is that he felt sick if he did not read books in one day. Robert Louis Stevenson stated from his own experience that The Adventures of Sherlock Holmes; a collection of twelve stories written by Arthur Conan Doyle was the effective medicine for curing his dental and chest pain temporarily. 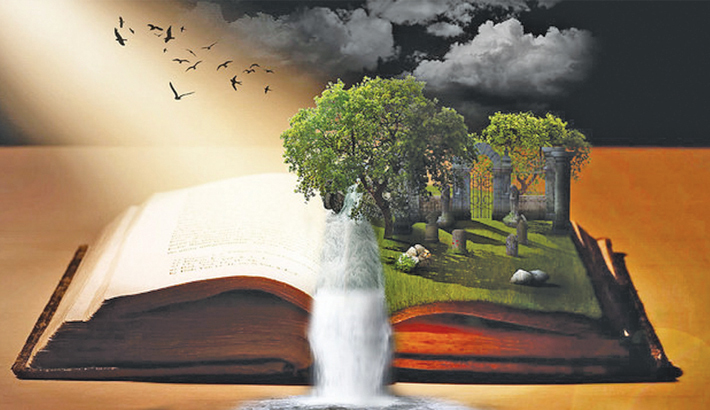 Every book has been bearing its own perceptions and perspectives and readers should read books according to their mood. Libraries are called as a mental diseases dispensary and bibliotherapy is considered to be a part of librarianship in any library. Librarians as a bibliotherapist can create book lists and encourage the patrons to read these books. In USA and UK, bibliotherapy is well-known for library lovers. What about our country? It is worth mentioning that in Bangladesh, Woodburn Public Library in Bogra has been providing this service for its every types of patrons. However, Librarians needs to be trained in the field of the psychological effects of reading and the motivation of the human personality to provide this service efficiently. There is no standard method to bibliotherapy, but the recent edited book titled “Bibliotherapy”, edited by Sarah McNicol and Liz Brewster demonstrated on the latest international practical and theoretical developments in bibliotherapy to explore how librarians, healthcare providers, and arts organisations can best support the health and wellbeing of their communities. We live in disquieting epochs and bibliotherapy could very well be an important part of helping us how to be a better mindful citizen in society by removing physical as well as mental disorders because this is the prerequisite for the upliftment of a nation.